A short documentary I shot and produced for the ‘repeal’ movement featuring Waterford-based artist Sam Doyle. 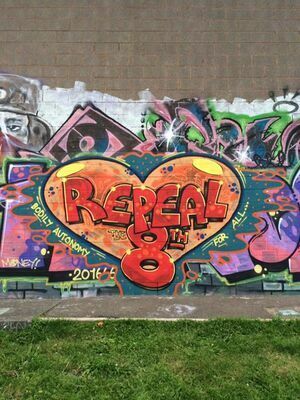 Posted in Misc and tagged Misery Hill, mural, Repealthe8th, Waterford at 10:41 am on August 30, 2016 by Broadsheet. Oh my, the cringe is off the scales…. That mural will probably be seen as the tipping point. On a recent stay down there, in Waterford city, I went to a Post Office to send a registered letter. I was told, “you’ll need a padded envelope for that, you can buy them across the road in the stationery shop”… eh? I got a bit confused, stood back from the counter and looked up at the booth and thought ‘yep, I’m in a post office, what did he say again’…. now back in the room, I smiled and took the instruction given – across the road. Off I went. It was sunny, everyone was pleasant, and I was in the zone, just potterin’…. When I asked for the jiffy envelope in the stationery shop, the two sales assistants who were engrossed in their own conversation eventually acknowledged me very pleasantly, and gave me my next assignment… “you’ll have to go across to the post office for change”….. But with kids and all it’s too much hassle. Maybe when they’re a bit older but I’d like to settle there. That would have the steam coming out of my ears Clampers. I don’t remember any mass shootings in waterford recently, so I’ll commend you on your patience. That’s not a mural, just a slogan. And a pretty uninspired one at that. Expect that area to be used for all sorts of political slogans from now on – “don’t pay water charges”, “refugees in”, “Refugees out” . Is that not just vandalism. Fupp the repeal the 8th. Im pro choice but im sick of hearing and seeing that crap all over the place. 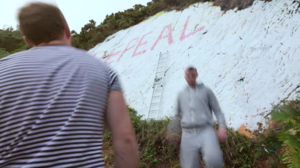 Where are all the usual suspects defending murals like this….. not interested because its a working class lad from Waterford in a tracksuit? I would assume it’s because this particular discussion has been largely played out. You either think they’re a good idea or you don’t. Both sides have stated their reasons over the last few months of these posts. You know they’re serious because they have REPEAL graphics on the decks of their boards. For the genuinely lovely memory this quote trigger I can only say thanks. It’s mad the things that can remind you of someone. That’s no right. The poor kiddies on there holliers don’t want to be looking at that. Replacing instructions on what to do if you feel like killing yourself, with instructions on what we need to do to be able to kill an unborn safely, freely and legally in our own country. Well done lads. Hope ye get loads of likes.